This is a picture of Richard and CJ who hosted the show called Let's Talk Trains from the beginning until CJ became a conductor for Amtrak. Richard and I first met at a San Diegan Club Meeting about ten years ago. We hit it off right away and Richard told me about the Coronado Belt Line and let me know when they would run. Jeff Hartmann and I took Amtrak and the San Diego Trolley to National City where we found Richard with the Santa Maria Rail Bus and he took us on a ride on the Coronado Belt Line. I did this Belt Line with Richard two other times each one getting a little more rail mileage. Richard also told me about Poway and one of the Saturdays that I was helping out at San Clemente with the first year Metrolink Beach Trains we drove down to Poway and rode the Trolley around the loop. Years later I rode the steam train there and I thank Richard for both of these unique trips. 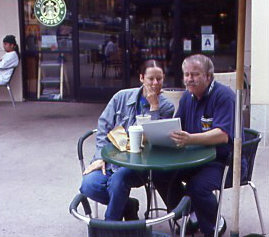 We did the San Diegan Club together for about three years until he got the idea to do the Lets Talk Trains Internet Radio Show. I listened to the first show and made my first call on show number 2. I then took Amtrak to Oceanside one Saturday morning where Richard picked me up and we went to that first studio in Carlsbad. That was the first of many times I would be a guest on his unique show. That show was when CJ called me the Amazing Chris Guenzler for the first time. CJ did it with such a flare something Richard could never equal. CJ at this point worked for BNSF in San Diego and would rush to the studio after working all night. The next time I was a guest the show had switched studios to one above Sorrento Valley. That would mean Richard either picked me up at Solano Beach or I drove. It was one of these shows I talked about all of the steam engines I had ridden. Most shows it was about the trips I had taken. Richard's plan was to have me on his show about once every three or four months. The three of us always had a blast in the studio and there was always plenty of laughs. After a few more years the show moved to the World Talk Radio Studio in Mira Mesa. For those shows I would normally take Amtrak down to San Diego and the San Diego Trolley to Chula Vista and spend the night there. I started with the Motel 6 but then switched to the Best Western South Bay Inn. It was the first time I stayed there Richard forgot and went to the Motel 6 and not finding me went to the studio without picking me up. I called the show and Richard was in shock when he realized I had come down for nothing. The next week we did the show and had a good laugh about it. Richard never screwed up again picking up me again. CJ then got a job with Amtrak and that left Richard to find another co host which he did. Richard took a Cruise and asked if conductor Larry and I would host the show. That show is known as the "Hi Jacked Show" and was incredible with the Engineer of the Metrolink Train from the Glendale accident who knew Larry called the show and told us what he went through that terrible day. 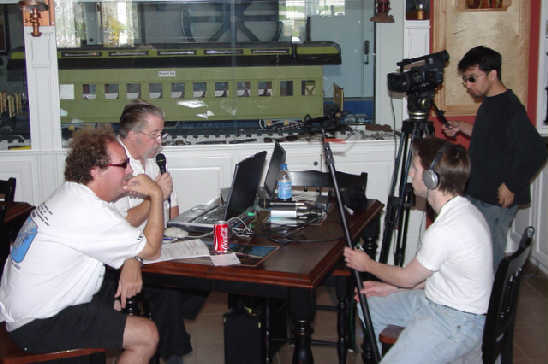 Richard always joked with me about how Larry and I hosted the best show of Let's Talk Trains up to that point. I think I called Richard from all over the USA during his time on the show. If I was on a train and someone had a cell phone and bars I would call the show. I did that from the UP 3985 Trip over Sherman Hill, the Milwaukee Road 261 Grand Excursion at Savanna, the NRHS in Ohio and Georgia naming just a few. I had him linked one my web site early on and would always remark in my stories when I called during a trip. Richard always sent me thank you for each time I called via E mail. Richard did come on my overall Million Mile Trip where he recorded the unauthorized Commercial he made saying "Chris Guenzler you just completed a Million Miles on the train where are you going?" I said "The Depot Inn & Suites in La Plata, Missouri not Disneyland as it is too expensive!" We did a three hours show from the lobby of the Depot Inn & Suites which I will always remember. I thought Let's Talk Trains would continue for years but just about that time World Talk Radio packed up and moved to Phoenix. Richard then moved the show to Blog Talk Radio and he did that until the time of his death. I found out he had left us just before I headed to Minnesota/Wisconsin and Duluth NRHS Convention Trip. I wrote this next part at the start of that trip. Sunday night just as I was packing, I checked Trainorders.com for anything about the trip and first spotted a post that the Lets Talk Trains web site was down. There had been no show last weekend due to Richard's illness and not a show yesterday. That post was linked to another post that was titled "A Sad Note" that told that Richard Hamilton had passed away either late Thursday night or Friday morning. That news really hit me hard. I had known Richard back in the days of the San Diegan Club which he formed and was a member until the end of that when he started Lets Talk Trains. I listened to the first show and then called in on the second. CJ his co host named me the Amazing Chris Guenzler and would say it with a bang. Richard just could never say it the way CJ did. Through the years I was a guest many times on his show in the three studios he used. I would take the train down to San Diego normally stay in Chula Vista at the Best Western Baymont Inn and Richard would pick me up. Richard had the best handle bar mustache that I had ever seen and I always held him in the highest esteem. Richard also worked at Poway where we would operate the trolley and twice Richard took me on trips on the Coronado Belt Line. Richard used to just look at the pictures on my web site and only occasionally would read the full stories. Richard was always full of life and a good friend. He joined us on the Overall Million Mile Trip and because of this I had not only him now but also Harold Marshall who is also on the Million Mile DVD Set. One of my fondest Richard moments was on that trip when we did a three hours show from the lobby of the Depot Inn & Suites. With no phone lines Richard got the idea that you could E-mail us at LTT and suddenly we got all sorts of E mails the kind we needed to do the show and the kind you didn't need spam. We had a blast together that day and I thought his show would be on for years. At least we all got seven years of Lets Talk Trains and I had all those years of Richard's friendship. He is one person I will never forget! I wrote this aboard Surfliner 763 heading to LAUPT which arrived early into LAUPT. We did a Tribute Show in memory of Richard Hamilton on Let's Talk Train and it was decided to try to continue the show. Some of us loyal listeners would take turns hosting the show. 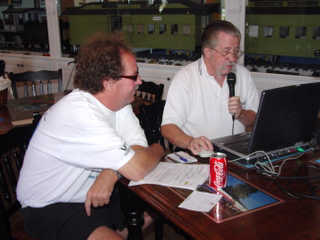 Gene from Phoenix hosted the first one and I decided to host the September 26th show. Nathan of Trainpixs hosted one show and would continue the Chat Room he started on his web site during the show times. What Richard Hamilton had started with Let's Talk Trains was just too good to let die and we could keep Richard's dream alive. May we do so for many more years to come! Each new show will be put up on Trainweb.com so checked there each Saturday if you want the show live or to listen to it after it is over.